Blog - How LED Light Banks Can Improve Your Life? How LED Light Banks Can Improve Your Life? Frequent power cuts, especially during the monsoon take on our nerves. Being suddenly plunged into darkness is not only infuriating but also causes much of inconveniences. Lanterns and candles often fall short of providing enough illumination at the time of extended power failures. Though emergency lights have arrived years before, the problem is not fully solved. Lately, Nordusk has introduced its special edition Light Bank that offers amazing results during power outages. What Makes Light Bank a Better Alternative to the Battery Induced Emergency Light? Looks similar to a normal LED bulb, Nordusk Light Bank is a powerhouse of various features that especially come handy during a crisis. A reliable emergency lighting function, Light Bank has an automatic switch and built-in-recharging system to help you get lighted up as soon as the power goes off. It usually lasts for 4 hours with an optimized performance that can save energy and costs by 80%. It gives uniform light output & there is no mercury content in it. It also gives glare free lighting. Offering a luminous efficacy of >94 lm Nordusk Light Bank arrives encased in a PC Body. It is durable and lasts for years. Here’s how it improves your life on a day to day basis. 1. It’s all about automation:Being featured with an automated switch, Light Bank gets switched oninstantly when the main power source fails. As a result, you don’t have to spend a single moment under darkness. If the automated switch is kept on, the light will get illuminated right at the time when the electricity fails. 2. Extended Battery Life: Secondly, Light Bank offers a battery life of 4hours, which makes it truly handy especially during prolonged power cuts. Frequent and extended power failures are not uncommon during storms and monsoons. In such cases, Light Bank comes handy. 3. Zero Filament Technology:LED lights don’t rely on a burning filament to generate light; so is Light Bank. Hence, they last longer. It comes with a rechargeable battery which allows you to get your light charged up when there’s power and use it later during the emergency situation. Unlike the conventional emergency lights, Light Bank comes with extended lifespan. In spite of being an emergency lighting solution, the brightness of Nordusk LED is no way lesser. With 850 lumens, the emergency light offers top-notch illumination with unparalleled brightness. 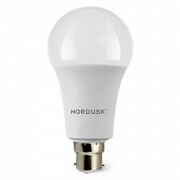 Ideal for everyday use, Nordusk Light bank also comes with a manufacturer warranty of 2 year. Compared to the other light bank price in Kolkata, Nordusk’s product is certainly an economical choice. So, what are you waiting for? Bring home the Nordusk Light Bank and bid adieu the exasperating power cuts. How can LED Floodlights contribute in Society’s Security?